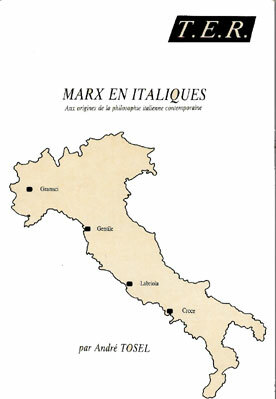 Italy is the only country where a far-reaching debate on Marx’s works took place. Its protagonists are : Antonio Labriola, Benedetto Croce and Giovanni Gentile. The first one claims the autonomy of the philosophy of praxis ; the second one (who was the friend and the publisher of the first), denies the consistency of this philosophy, and reduces historical materialism to a methodology of the economical factor ; and the third one contradicts the second and asserts the reality of « Marx’s philosophy », but in refuting its materialist components.As a consequence, Italy seems to have barred Marx’s way ; but paradoxically, it is through Croce’s and Gentile’s idealism that Marx will be read by Italians. In effect, Antonio Gramsci, who was first close to Gentile, will try to take up the challenge addressed by the epoch to liberalism as well as to Soviet marxism, and he will redefine the philosophy of praxis in order to give a cosmopolitic sense to the translation of philosophy into politics and history.